Here is a photo shamelessly stolen from the www.emog.com. It shows the reinforcement bracket for the upper damper mounting on the stock hoop. The rest of the setup is non-standard. picture from jack austins car??? It looks like a complicated modification. Presumably there are no Coil Springs with this one Harald? Presumably there are no Coil Springs with this one Harald? The coil spring is the red bit Frank. This 'solution' does not look 'elegant'. Had a feeling you might! This is all very interesting but still confusing to lil ole me. cart springs now you see me now you dont? coils, you defiantly see me, but where have the leafs gone? and how much rebound can one get in such a small, short stroke? If you are doing nothing, how do you know when you are finished? Sorry Peter - cart springs = nickname for leaf springs. 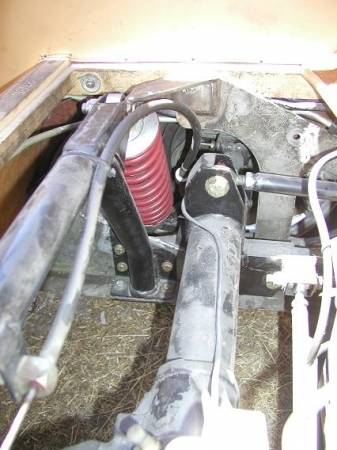 BTW, was doing a bit on RTA on Saturday and I have approx 7 - 8 cm clearance from top of diff to the access panel cross-brace strut (it has a clear mark from the top of the diff!). mine also was similar to yours (top to diff top measurements) and also the lower one is about the same to 30 mm. what worries me is that for the diff to hit the top board, the spring has to go into massive reverse deflection? surly springs are made to support the weight and defiantly not go in reverse?